The factors that ultimately lead to an anterior cruciate ligament (ACL) injury are complex. The type of sports activity, population segment, posture, bone morphology, and the internal biomechanics of the knee each play a role in risk of injury. A multitude of studies have been performed in these individual areas, which have provided information to form a prediction algorithm for ACL injury. Sports activities, such as soccer, that place a premium on jumping and landing appear to have an increased incidence of these injuries. Female athletes appear to be at a higher risk, potentially due to differences in lower extremity shape or motion patterns. Bone morphology may contribute to the likelihood of ACL injury (i.e., posterior slope and relative tibial size), and the dimensions of the “joint play envelope” may help determine the amount of force necessary to cause injury. While there is no absolute consensus on the biomechanical mechanisms leading to non-contact ACL injury, there is extensive evidence to indicate that ACL injury results from a combination of these factors. 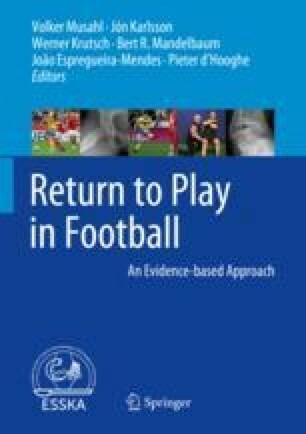 Clinicians should consider these factors when mapping out a safe return to play for sports such as soccer. Those athletes more at risk for injury may benefit from more intensive or specific physical training.